As the verified Word of God, the Bible is the greatest book ever written. One of the many reasons why is the astounding number of specific fulfilled prophecies it contains. And many of these prophecies relate to the life and times of the Messiah. For example, the Book of Daniel foretold the exact timing of the Messiah's arrival 483 years in advance (Daniel 9:25)! The Book of Zechariah foretold the betrayal of Messiah for 30 pieces of silver (Zechariah 11:12), and the Book of Micah foretold the Messiah's birthplace as Bethlehem (Micah 5:2). The scriptures contain dozens upon dozens of Messianic prophecies just like these, all of them pointing to one man - Jesus of Nazareth. But did you know the Bible contains even more evidence of the divine authority of Jesus? Despite the incalculable odds of fulfilling just a few dozen, the Messianic prophecies only scratch the surface of what the Bible has to say about the Messiah. In fact, if Jesus is to be believed (and He is), the entire Old Testament points to Him. That's right. The entire Old Testament! Unfortunately, many Christians neglect the Old Testament when it comes to Bible study. Sure, they might read Genesis, Psalms, and Proverbs. But for the most part, far too many Christians view the other books of the Old Testament as boring or irrelevant. Yet, nothing could further from the truth! Because a careful study of the Old Testament reveals God's master plan to send a Savior whose life is given as an offering for sin (Isaiah 53). In reference to what we call the Old Testament, Jesus said, "You search the Scriptures because you think they give you eternal life. But the Scriptures point to me!" John 5:39 (NLT). Jesus also said He did not come to abolish the law or the prophets, but to fulfill their purpose (Matthew 5:17). And following His resurrection, He explained how the Scriptures pointed to Himself (Luke 24:27), and how everything written about Himself in the law of Moses, the prophets, and the Psalms must be fulfilled (Luke 24:44). In doing this, Jesus wasn't referring only to the Messianic prophecies. He was also referring to the stories, symbols, laws, customs, and other elements of the Old Testament. Because every aspect of the Old Testament points to Jesus. As the Book of Hebrews states, "The old system under the law of Moses was only a shadow, a dim preview of the good things to come" Hebrews 10:1 (NLT). In other words, the law and the prophets gave us a glimpse into the life, death, and resurrection of Jesus. And one of these glimpses is described in the Book of Exodus. It's called the Ark of the Covenant. During the exodus from Egypt, God instructed the Israelites to build a box known as the Ark of the Covenant. But God didn't just say, "Hey, build a box." He provided detailed and specific instructions on how the box was to be made. And you know what? When you study His instructions, you'll find they serve to do one thing, and one thing only - glorify the name of Jesus Christ. God's description of the Ark is found in the Book of Exodus. Here, He reveals its dimensions, how to carry it, and what to place inside it. He instructs the Israelites to make the Ark's cover (which He calls the "mercy seat" or "place of atonement") out of pure gold. On it, they are to fashion two angels made of pure gold and place them on either end, facing each other, and looking down on the mercy seat (Exodus 25:18-20). He then instructs them to place the stone tablets inscribed with the Ten Commandments inside. We later learn the Ark also contained Aaron's staff that sprouted leaves as well as a jar of manna (Hebrews 9:4). Next, God instructed the Hebrews to make a special curtain and place the Ark of the Covenant behind it. This curtain was to separate the Holy Place from the Most Holy Place (Exodus 26:33), and it symbolizes the barrier sin creates between mankind and the Creator. In the Most Holy Place, God Himself was present in a cloud over the Ark's atonement cover or mercy seat (Leviticus 16:2; Numbers 7:89). This was the place where the high priest sprinkled the blood of a sacrifice to atone for the sin of the people (Leviticus 16:14-15). While the Israelites probably didn't understand the purpose of all these instructions, God's purpose was later revealed in the life, death, and resurrection of Jesus Christ. Jesus said, "the Scriptures point to me!" (John 5:39), and God's instructions for the design and use of the Ark of the Covenant are no exception. Just study the Gospel accounts, and you'll realize how true it is to say all the Scriptures point to Jesus. Let's start with the contents of the Ark. One of the items found inside was a jar of manna (Hebrews 9:4). Manna was the bread from heaven God supplied to the Hebrews as they wandered in the desert (Exodus 16). This is symbolic of Jesus, who is the true bread of life. Jesus Himself said, "Moses didn't give you bread from heaven. My Father did. And now He offers you the true bread of heaven. 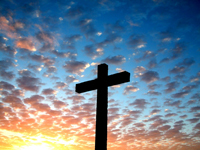 The true bread of God is the one who comes down from heaven and gives life to the world" John 6:32-33 (NLT). The Ark also contained Aaron's staff that sprouted leaves (Hebrews 9:4). Do you remember the story of Aaron's staff? God had Moses place twelve wooden staffs (representing the twelve tribes of Israel) in front of the Ark. Each staff featured the inscribed name of its tribe's leader, and God promised buds would sprout from the staff of the man He selected to serve as High Priest (Numbers 17:1-8). The presence of Aaron's staff in the Ark is fitting, since Jesus serves as our High Priest (Hebrews 4:14-15). As High Priest, Jesus approached God on our behalf and offered a blood sacrifice to atone for our sins. But those weren't the only items in the Ark. It also contained the stone tablets inscribed with the Ten Commandments (Hebrews 9:4). This is symbolic of the dedication Jesus had to the law. Contrary to what some believe, Jesus didn't come to abolish the law, but to fulfill it (Matthew 5:17). Isaiah said the Messiah would exalt and honor the law (Isaiah 42:21), and Paul described how Jesus rescued us from the curse pronounced by the law because, when he was crucified, he took the curse for our wrongdoing upon Himself (Galatians 3:13). However, it's not just the contents of the Ark that point to Jesus and glorify His name. The design of the Ark itself points to Him. Weeping outside of the empty tomb, Mary Magdalene looked inside and saw two angels - one sitting where Jesus's head had been and the other sitting where Jesus's feet had been (John 20:12). Does that sound like a familiar image? It should. Remember, on the cover of the ark, God commanded the Hebrews to place two angels on opposite ends. These two angels were commanded to look down upon the mercy seat, also known as "the place of atonement" (Exodus 25:18-20). This is precisely what Mary saw in the empty tomb, angels at opposite ends of the place where Jesus was laid to rest - the true mercy seat and place of atonement. The Ark foreshadowed the coming of Jesus and the events surrounding his resurrection. Jesus was the ultimate sacrifice. As our High Priest, Jesus entered the Most Holy Place and secured our redemption forever with His own blood rather than the blood of animals (Hebrews 9:12). When Jesus did this, the curtain in the Temple which separated the Holy Place from the Most Holy Place was torn in two, from top to bottom" (Matthew 27:51). Sin no longer separated men from God, because once for all time, Jesus appeared and removed our sin by giving His own life as a holy sacrifice" (Hebrew 9:26).